The Sycamore Balanced Composite was created June 30 1997. Sycamore Financial Group claims compliance with the Global Investment Performance Standards (GIPS®) and has prepared and presented this report in compliance with the GIPS standards. Sycamore Financial Group has been independently verified for the periods September 30, 1996 through December 31, 2017. Verification assesses whether (1) the firm has complied with all the composite construction requirements of the GIPS standards on a firm-wide basis and (2) the firm’s policies and procedures are designed to calculate and present performance in compliance with the GIPS standards. The Sycamore Balanced composite has been examined for the periods June 30, 1997 through December 31, 2017. The verification and performance examination reports are available upon request. Sycamore Financial Group is an independent registered investment adviser. The firm maintains a complete list of composite descriptions, which is available upon request. Results are based on fully discretionary accounts under management, including those accounts no longer with the firm. Returns include the effect of foreign currency exchange rates. Composite performance is presented gross of foreign withholding taxes on dividends, interest income, and capital gains. Withholding taxes may vary according to the investor’s domicile. Composite returns represent investors domiciled primarily in the United States. Past performance is not indicative of future results. The U.S. Dollar is the currency used to express performance. Returns are presented gross and net of management fees and custodial fees and include the reinvestment of all income. Both gross and net returns are reduced by trading expenses for accounts that pay commissions on trades. Beginning in 2015, certain accounts pay an asset-based fee to their custodian that includes all trading expenses. This results in a “pure gross” return for these accounts as only net of fees returns are reduced by this asset-based fee. Pure gross returns are shown as supplemental information to net of fee returns. Net of fee performance was calculated using actual fees. The annual composite dispersion presented is an asset-weighted standard deviation calculated for the accounts in the composite the entire year. Additional information regarding policies for valuing portfolios, calculating performance, and preparing compliant presentations is available upon request. The investment management fee schedule for the composite is 1.5% on the first $0.5 million, 1% on the next $1 million, and 0.8% on the remaining stock portion, 1% on the first $0.5 million, 0.75% on the next $1 million and 0.5% on the remaining mutual fund portion, and 0.75% on the first $0.5 million, 0.5% on the next $1 million, 0.4% on the next $8.5 million and .3% above $10 million on fixed portion. Actual investment advisory fees incurred by clients may vary. The performance data given represents past performance and should not be considered indicative of future results. General market conditions and or economic conditions can have significant impact on the performance of this composite or your individual investment. Principal value and investment return will fluctuate, so that an investor’s shares when redeemed may be worth more or less than the original investment. The separate account is not FDIC-insured, may lose value and is not guaranteed by a bank or other financial institution. 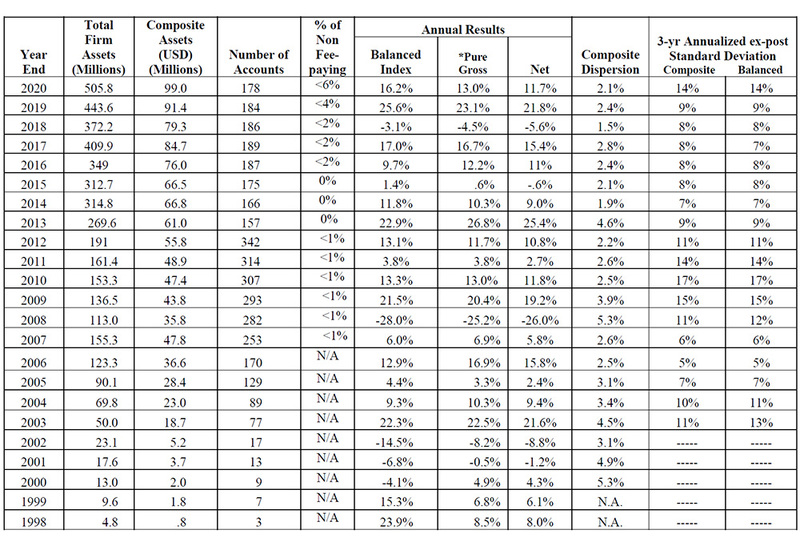 Our separate account performance data is reported as a “composite” of similarly managed portfolios. As such, investors in the same separate account may have slightly different portfolio holdings because each investor has customized account needs, tax considerations and security preferences. These performance results contain portfolios that reinvest dividends and interest as well as portfolios that withdraw all or a portion of this income. We have compared our composite performance to a 75%/25% blend of the S&P 500 Index and the Barclays Aggregate Composite Bond Index (previously known as the Lehman Brothers Composite Bond Index). Your portfolio may fluctuate more or less than this index blend. This is a measure of the variation of individual account performance within our composite. Your portfolio may perform better or worse than our composite and while there is no guarantee of future performance, the composite dispersion gives you guidance of the amount of over performance or under performance that you may expect during most periods. © 2018 Sycamore Financial Group.All other trademarks are the exclusive property of their respective companies.